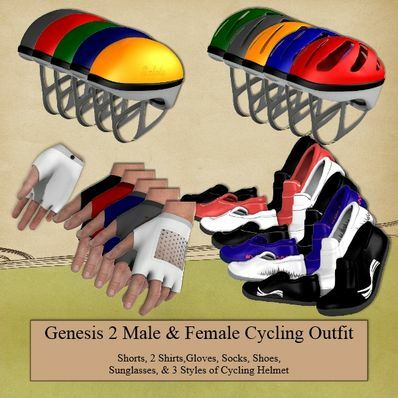 Cycling Outfit for Genesis 2 Male & Female for use in Daz Studio 4.6. I have also included several Textures. There are 6 matching Team sets, plus plain items for your own colours & tetxures. Also included a very basic cycling Pose. Not perfect by a long way, but it is a starting point. I think I can make a space helmet out of this. Thanks. Thank you very much. These are a one of a kind. These are brilliant and a great accompaniment to the Cycling outfits part 1 and 2.. These could also be used as apparel for climbing and also use the shorts and shirts and use custom textures.. Fantastic stuff!! Will come in very handy these.. Great work. Thanks.